The trend of indoor growing has been on a tremendous rise. Along with that, there have been LED grow light brands popping up like mushrooms. Making it difficult for the growers, both rookies, and intermediates alike. The pro growers have lesser headaches with their higher buying power and valuable experience, which means bigger differences between starters and professionals. Viparspectra has been a leading, popular choice when it comes to indoor grow lights among beginners and intermediate growers alike. We thought of reviewing the Viparspectra 300w LED Grow Light to help make that crucial decision of purchasing the perfect LED grow light for your indoor nurseries. 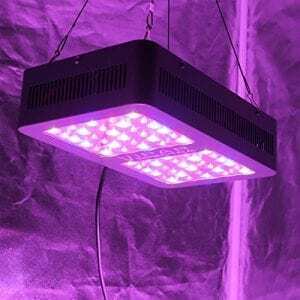 Should you go for LED grow lights for growing plants indoor? Thinking about replacing your HPS/ HID grow lights? If you’re currently using incandescent bulbs, wherever you found them, the Viparspectra 300 Grow Light can replace three of those. The answer to this important question is a big YES! One may argue that LED’s are expensive and we do agree. It might be a sizable investment if you’re a beginner to indoor growing and hydroponics. 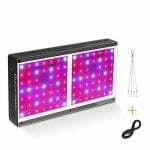 However in the long run, you will enjoy the dividends as LED grow lights consume way less energy than alternative light sources with Viparspectra Grow Lights under review consuming only 136 watts. Alternative HPS/MH HID (High Pressure Sodium/Metal Halide High Intensity Discharge) lighting requires the services of ballasts, a component that keeps their light from flickering extensively and ballasts emit a lot of heat and consume a lot of power. In comparison, LED’s create less heat, therefor you will be saving the energy that you spend on cooling mechanisms too. HPS/MH HID can be costly in maintenance too with them requiring frequent bulb replacements. When you consider all these savings, it’s a wise choice to go for LED grow lights. The fact that Viparspectra now offers a range of reliable LED lighting products at affordable rates brings you another step closer to that crucial choice. Viparspectra 300W LED Grow Light is the ideal replacement for 250W HPS/HID light. The LED light doesn’t require a ballast. It takes care of cooling too with in-built large cooling fans and heat sinks while consuming only 136 Watts although it’s been rated for a 300 watt output. It’s very important to keep in mind that there’s no point of measuring light intensity with Lumens. It’s highly irrelevant if a light looks bright to human lights or not, because we’re looking to provide sufficient light for plants which respond to different light wavelengths when compared to us humans. Photosynthetically Active Radiation (PAR) designates the wave band of solar radiation between 400 and 700 nanometers that plants use for the process of photosynthesis, making it the ideal measurement of light intensity and coverage for grow lights. Viparspectra 300W LED Grow Light provides is a full spectrum LED grow light, making it ideal for many types of plants in various phases in their growth cycle. Coverage is very important as some grow lights focus the light output more towards the center creating hots spots and uneven coverage. This is mainly due to design flaws. 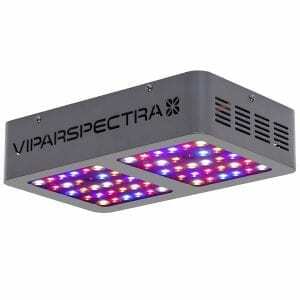 In comparison, Viparspectra 300 Grow Light shines bright with a good design to provide even light coverage. When placed above 24 inches from the canopy of your plants, the PAR maps out to provide the best coverage within an area of 2 feet by 2 feet. The light does reach out to an area of 3 by 3 feet, but it’s not a good idea to cramp in too many plants since flowering needs a lot of light, so for optimum growth, using a Viparspectra 300 LED Grow Light per 2 square feet is optimal for growing. When it comes to the number of plants per LED light, we highly recommend two per light with around 2.25 square feet for a mature plant without supplemental lighting for flowering. You can squeeze in four per light if you’re willing to add more lighting for flowering when it’s needed. 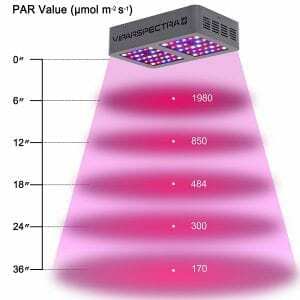 In summary, below is a breakdown of pros and cons of Viparspectra 300 300W LED Grow Light. Affordable price, especially for newcomers and mid-tier growers. Low energy consumption at 136 watts which means lesser utility bills and less chance of unwanted attention from the authorities. Built-in self-cooling fans and heat sinks reduce the heat created, protecting the light as well as your plants. There’s no need to provide additional cooling too! High intensity, full spectrum and even light comparable to natural sunlight. The LED light comes with a hanging-kit and a 6-foot power cord, making installation easy. LED bulbs used come from reputable companies like Bridgelux and Epiled ensuring the quality. You have the ability to daisy-chain multiple units if you want to grow more than 2-4 plants later on other than going for a new, larger LED grow light. Viparspectra 300W Grow Light has three separate light options such as White, Red and Blue enabling you to customize according to the type of plants that you have under each light. LEDs of the Viparspectra 300 last between 50,000 and 100,000 hours (approximately 6 to 11 years) which gives you ample time to go for an upgrade without a need for replacements. The grow light comes with a 30-day satisfaction guarantee, so you can see how your plants respond to its light before making a commitment. It has a 3-year warranty which is great and shows Viparspectra’s confidence about their products. The Viparspectra 300W LED Grow Light is more suitable for beginner and medium level home growers with its limitations. There are bigger and better lights for large scale growers. This is a great light for its price. 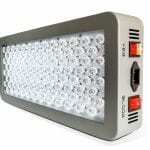 Especially beginning growers make a great choice by acquiring this light. You can place multiple V300’s adjacent to each other for a bigger coverage area. One light will cover 2-4 plants. Check out the dimmable version right here. This is the Viparspectra DS300 where you have more control on the light output by dimming the light. 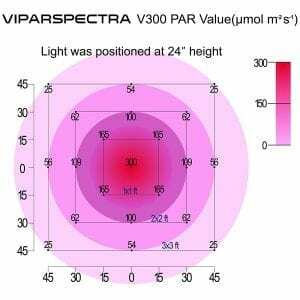 Are you looking for a larger LED grow light that looks like the Viparspectra 300? Viparspectra also made the Viparspectra 600. Read our review right here!